The Holocaust was a horrific event in Jewish history. Imagine being thrown out of your house to live like an animal. Think about working hard labor seven days a week and doing everything the Nazis told you to do just so you would not be killed. Picture people dying every moment from disease and starvation. Imagine being scared and alone and wondering if your family was alive or not. Always thinking it could be your turn next, and any minute they could come and take you away. In this paper, along with some history, I will tell you the stories of a few Jews who were able to survive the Holocaust in honor and memory of those who were not as lucky. In 1933-1945, Adolph Hitler was Dictator of Germany. Hitler’s party, the National Socialist, or Nazis, gained power even though they did not win a majority of the votes. After World War I, many Germans were left jobless with no money and depressed. The Nazis promised the citizens a better life and that they would lead Germany back into power. At first, lots of people did not take Hitler seriously. Many even thought that Hitler would not be able to attract strong believers. To their surprise, Hitler ended up to be a very captivating and convincing speaker. Hitler uplifted their spirits by telling the Germans and Austrians who were blond and blue eyed, the “Aryan race”, that they were the smartest, strongest, and superior to all other races on earth. Since people believed the Germans were perfect, Hitler blamed other people including the Jews for Germany’s problems. So the thing Hitler needed to do was to get rid of the Jews. This is quite interesting because rumors state that Hitler may have been part Jewish. Killing all the Jews was not the only goal of Hitler, he also wanted to take over all of Europe. To reach this goal, in the end, he would kill 6 million Jews which was 2/3 of all the Jews in Europe and also millions of other innocent people and finally himself. Jews were kicked out of their homes and Nazis moved in. The Jews were taken into small crowded areas called ghettos. In the ghettos, the Jews lived ten to fifteen people per room. To keep Jews from the rest of the cities, the ghettos were surrounded with walls or barbed wire fences. People were let out only during the day and had to be back at a certain time. They gave the Jews in the ghettos very little food, medicine, or fuel. To get food, many would have to bribe the Nazis with jewels or valuables. Those that were not lucky enough to have possessions died from starvation. Since so many people were crowded in one place, there were many diseases going around. The kids in the ghetto were forced into the Nazi version of slave labor, having to do work for the Nazis. Jews would be rounded up, driven to the woods on the outskirts of town and killed. The Nazis left the bodies in a ditch that they had the victims dig. To protect themselves, Jews would build bunkers or secret hiding places within the ghettos. Luckily, some did stay alive and never needed to go to a concentration camp. Basia Mandel was born in Poland in 1925. Her father was a tailor and she had beautiful dresses to wear and a lot to eat. 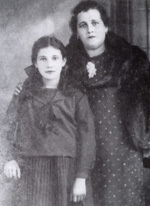 In 1939, Basia and her family were taken to the ghetto. At 17 years old, she worked hard labor for the Nazis. At that time, she was even lucky to be alive. Basia, her parents, and her fiancé Meier all knew it was only a matter of time before it was their turn to be killed. Basia’s father was part of a group of people that were rounded up, driven to the outskirts of town and executed. In order to survive, Meier, Basia’s fiancé, built two underground tunnels so that if they needed to escape they could. One day, the Nazis came in, and people with bunkers hid in them. In a bunker leading to the sewer, Basia’s mother and fiancé were found. They were taken to Auschwitz where her mother was killed. But her fiancé escaped and came back to the second bunker where Basia was hiding. The ghettos were being cleared out, and it wasn’t safe for them anymore. They decided to hide in the woods until things settled down. While hiding, Basia became very sick from eating unripened vegetables all the time. Meier would sneak out at night and get food for them even though it was extremely dangerous. Basia and Meier hid in the woods for the next five months. One day, when they were spotted, Basia fell over a steep cliff and rolled down. She landed near a lake and hid in the bushes until night. Lost and drenched, Basia saw a church and knocked on the door. Some nuns answered the door and agreed to let her in. They let Basia stay there for a week but had to let her go because it put them in great risk. Basia made it to the bunker where Meier was waiting for her. There were 15 people in the bunker that all survived. Basia survived the Holocaust. In the early 1940s, the Nazis had turned the concentration camps into slave labor. The Nazis built a total of 23 main camps that included about 700 smaller sub-camps. The concentration camps were brutal. Guards treated inmates worse than slaves. They did not care whether prisoners lived or died. The living conditions were horrible. There was only one toilet overflowing with human waste, no showers, and lice were eating people alive. To make matters worse, Nazi doctors did cruel experiments on the captives that were often young children. The Nazis set up death camps in Poland. The only purpose of the Nazi death camps was mass murder mostly of Jews and gypsies. Inside these camps, the Nazis set up gas chambers that killed thousands of people each day. The Nazis built the killing centers in rural areas in order to hide what they were doing. By the time the death camps were shut down, Nazis had already gotten what they wanted. A total of 5,370,000 had died in the death camps. 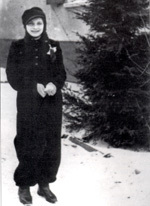 Rose and her Hasidic Jewish family lived in a small town in Poland. One day, Rose’s father heard that the Nazis were killing all the Jews in the small towns, so they move to the city. But, the Germans invaded the city and forced her and many other families into the ghettos while the Nazis took over and claimed their homes. Rose's family was forced into a ghetto with 15 people in two tiny rooms. Rose’s Dad knew a woman, Mrs. Chica, who agreed to hide Rose’s family in her chicken coop. The Silberbergs escaped one night from the ghetto to live in the chicken coop. Food was in short supply, and they were starving. Mrs. Chica had only bread to bring them to survive. Rose remembers cutting her slice of bread into 100 pieces to save and eat throughout the day, little by little. Mrs. Chica lived in an attached house with a neighbor that hated Jews. Rose and her family stayed in the chicken coop day and night. They were not allowed to move around and could only talk in a whisper for fear that the mean neighbor and her visitors would hear the family and turn them in to the Nazis. Rose’s 1½ year old sister, Mala, made too much noise, and Rose’s Dad had to give Mala away to save the lives of the rest of Rose’s family. At one point, they ended up back in the ghetto because they were all starving and hoped to find food or food coupons. One morning, the Nazis surrounded and invaded the ghetto. Rose’s parents were forced onto a train to the Auschwitz concentration camp and were killed. Rose and her Aunt Sara were able to hide in a secret hiding place (called a bunker) above a chandelier but they were also found and captured. The Nazis forced them to a hospital as a holding place to get onto the next truck to Auschwitz. Although Rose’s Aunt knew she would not survive, she silently took Rose to a window and pointed in the direction of Mrs. Chica’s home. A hospital worker helped Rose escape. Rose had never seen the house in daylight. Scared and alone, Rose spent 5 hours crawling in the grass of a ravine to get back to the Mrs. Chica’s home where Rose stayed for the rest of the war. Rose survived the Holocaust. On May 7, 1945, the war was over and the Nazi terror was defeated. At the same time, people thought both the war and Holocaust should be left behind to create a better future. After the war, it was almost impossible to go back to the way it was before the war. Returning home was also dangerous. As many as 30 million were stranded and had no home. After the war, anti-Jewish riots broke out in several Polish cities. The homes of survivors had been burned down, and survivors had no place to go. They ended up in displaced persons or DP camps. In the camps, people had to stay while waiting to emigrate to places like South Africa, the United States, and Palestine. Many DP camps were at army barracks and slave labor camps. Conditions were very poor. They were crowded and unsanitary. Some displaced people were still held like prisoners behind barbed wire with nothing to do. Although the Holocaust is over, the anti-Semitism has never ended. There are still people today for Hitler. They are called Neo-Nazis. They believe in Hitler and what he was doing. They have ruined temples and the homes of Jewish people. Neo-Nazis spread Hitler’s old lies about Jews and other minority groups. They distribute Nazi propaganda and Nazi symbols. Today in the United States there are other anti-Semitism, racism, and hate groups called the Order, Skinheads, the Ku Klux Klan, Al Qaeda and many others. Lots of people that experienced the Holocaust have trouble talking about it in their later years. For some, these memories are too painful, and they fear letting these memories interfere with a normal life. Unfortunately, most Germans today cannot tell their children the truth of what happened in the Holocaust. After the war, most German citizens claimed that they only learned at the end of the war about the horror committed in their back yards. Yet many people today don’t believe that it was possible not to know what was going on. Nina Rensch says, “My grandmother says she didn’t know, but I think it is easier to turn your eyes away and not know.” What we are left with is people doubting if the Holocaust really did happen or not. On the other hand, some survivors work to educate the world about what happened during the Holocaust. To remember the Holocaust they have created many memorials and museums like the Center for Holocaust Studies, Holocaust awareness museum, Holocaust Education center and memorial, Holocaust Learning Center, and many more. While preparing my paper, I was able to meet and hear the stories of two Holocaust survivors. While in Florida in April, my grandparents took me to hear Allen Brayer speak about his horrible childhood in Poland. When Allen was a young boy, he hid in the woods of rural Poland with other Jews for two years trying to escape from the Nazis. He told us how a Nazi soldier kicked him so hard in the chest that he still has a big dent in his chest to this day. 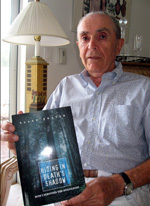 Allen recently wrote a book called Hiding in Deaths Shadow: How I Survived the Holocaust. At my friend’s Bat Mitzvah, I had the honor of meeting Tibor Rubin, a Holocaust survivor who was awarded a Metal of Honor. As he wore his Metal of Honor, he told me the story of how he spent 14 months in a concentration camp where his parents, sister, and brothers were killed. After the war, he moved to the United States and he joined the US Army. Tibor saved the lives of over 40 people during the Korean War using the survival skills that he learned during the Holocaust. 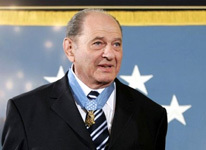 After being awarded the Medal of Honor, Tibor now travels the world telling his courageous story. Axelrod, Toby. Rescuers Defying The Nazis: Non-Jewish Teens Who Rescued Jews. New York: The Rosen Publishing Group, Inc., 1999. Greenfeld, Howard. The Hidden Children. Boston: Houghton Mifflin Company, 1993. Landau, Elaine. Holocaust Memories: Speaking The Truth. New York: A Division of Grolier Publishing, 2001. Rosenberg, Maxine B. Hiding to Survive: Stories of Jewish Children Rescued From The Holocaust. New York: Clarion Books, 1994. Strahinich, Helen. The Holocaust: Understanding and Remembering. New Jersey: Enslow Publishers, Inc., 1996.